We don’t need research to tell us that giving makes us happy. The happier we are, the more energy we have, the better we think, and the more friendships we develop. Giving not only feels good, but it strengthens the heart, lowers stress, and can literally add years to your life. At Penguin Random House Australia, we are incredibly proud of our Community & Social Responsibility (CSR) program and the ways in which, through our efforts, we give back to local communities in need. 2016 was a record breaking year for our CSR activities, and especially in working with our main charity partner, the Indigenous Literacy Foundation (ILF), to whom we donated AU$ 100,000. 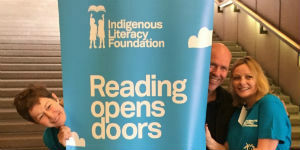 The core aim of the ILF, founded in 2005, is to draw upon the skills and expertise of the Australian book industry to address literacy levels in remote Indigenous communities. This is achieved through the delivery of books and literacy resources to remote communities, in addition to advocating to raise community awareness of Indigenous literacy issues. 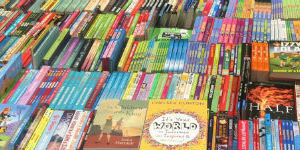 Penguin Random House’s primary contribution to the ILF is monetary, and ensures that funds are directed towards putting books in the hands of children who need them the most. And with only 25% of Indigenous students in remote areas at the minimum reading standard, it is a cause close to our hearts. But money is not everything, and additionally, we support the ILF with physical people power, working with them on their Annual Trivia Nights, Indigenous Literacy Day, and through brain power and pro bono work. Their flagship event, Indigenous Literacy Day, held annually on the first Wednesday of September, both celebrates reading and raises much-needed funds. 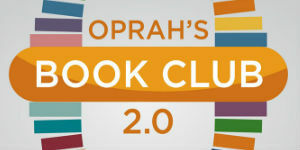 The Great Book Swap, which encourages participants to swap a favorite book in exchange for another for the cost of a gold coin, was last year held at the Sydney Opera House. Joined by ILF Ambassadors, and Penguin Random House Australia authors, Richard Flanagan, Justine Clarke and Alison Lester, school children from the remotest communities in Australia came together to help spread the word about improving literacy levels and opportunities for Indigenous children living in remote and isolated areas of our country. Penguin Random House volunteers, Meredith Curnow, Jessica Owen, and Beverly Cousins were on hand to help with the swap, participate throughout the day, and distribute backpacks and books to children who attended the event. Beyond Indigenous Literary Day, and to further support ILF in 2016, we undertook Book Sale Fundraisers at our offices and warehouse sites throughout the year, with thousands of dollars raised and every cent going back to those who need it most. 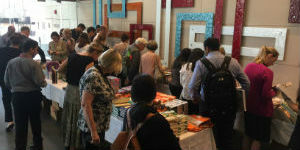 The key book sale events were held in Sydney and Melbourne in November, where hundreds of enthusiastic shoppers lined up to stock up on Christmas presents to support our cause. In Sydney, shoppers were phoning people to join them at the book sale and grab a bargain, and in Melbourne, even the wettest of weather didn’t dampen spirits (nor discourage spending, with AUD 38,000 raised). We are very proud to work with the ILF – both now and into the future – and even prouder of what we have proven that we can achieve together.